State of completion: Concept work started. Notes: Game is not listed in the Atari Dealer Price List Q3/1995. spent two weeks sketching, then presented what we'd done to management. They scratched their heads and asses and said they'd get back to them. project. It never got far enough to even think about the "cartridge vs.
platform hopper since that's what Sonic was. 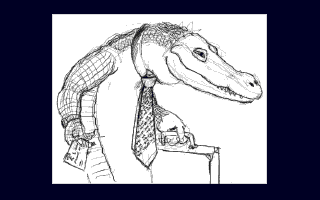 attourney alligator - fitting, eh? CR: How about Black ICE\White Noise? before that ever came out.